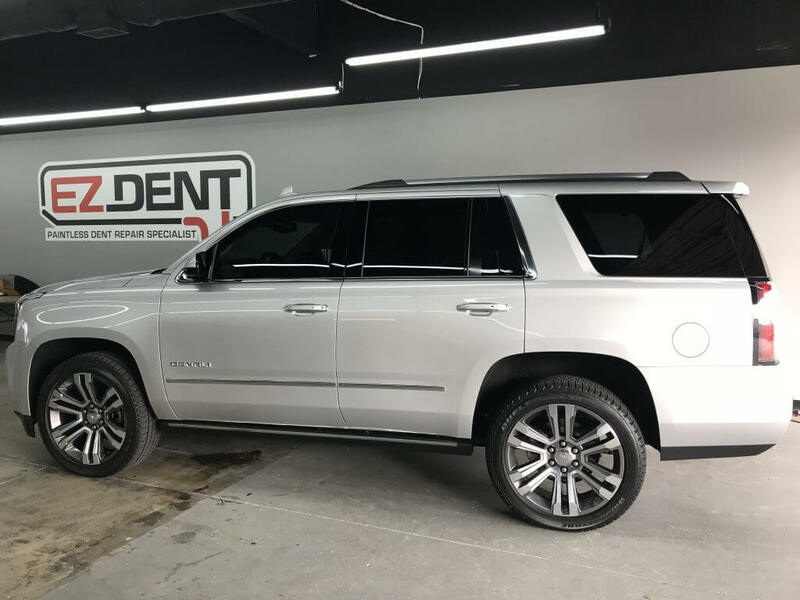 If your GMC has been dented, the first response is usually to take it to a body shop – but that isn’t always the right choice. There’s no denying that body shops are what you need if your car has suffered extensive damage, but they aren’t needed for simple dents and dings. EZ Dent uses a Paintless Dent Repair process that can fix the creases in your vehicle without the time or hassle of a trip to the body shop. If there’s no body shop, how can my GMC be fixed? Paintless Dent Repair works by carefully removing the damaged panel, then massaging the metal back into place with special portable tools. Best of all, there are no strange bonding agents or chemicals involved. When we’re done fixing the damage to your vehicle, it will look as close to new as it’s possible to get. In fact, Paintless Dent Repair is the same technique many dealerships use to repair dents in vehicles still on their lot. How fast can you fix the dents in my GMC? The majority of repairs are done in less than one hour. If your vehicle has more damage than most, it may take longer than average to fix. Before you hire us, our team can look at photos of the damage and give you a better estimate of exactly how long it will take to repair your vehicle. *Disclaimer – EZ Dent is not affiliated with GMC or authorized GMC dealerships. To get more information about our repair process, or to schedule a service appointment, contact EZ Dent today.